The brand Hageland (which I really enjoy) seems to be called Cachet now, but the packaging looks the same. I found this bar when looking for a baby shower card at a local superstore. I never thought to look in the greeting card aisle for chocolate, but there it was. 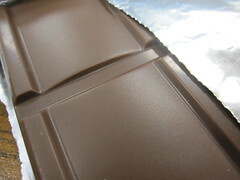 Cachet has a wide variety of "Limited Origin" chocolate bars from milk chocolates in the 30% range to very dark at 80%. 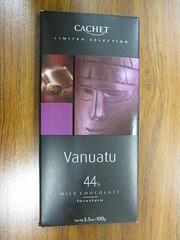 The beans in this bar were from Vanuatu, an archipelago over 1000 miles east of northern Australia. The bar had a strong cocoa smell with a bit of smokiness. The flavor was rich and just slightly bitter, with a wonderful hint of toasty caramel. Though I usually prefer darker than 44% cocoa, this bar was quite delicious. The back of the box mentioned hints of coffee (along with spice, caramel, and smoke), but I wasn't refined enough to taste the coffee. Still, I was very pleased with the bar, especially since it was only $2.